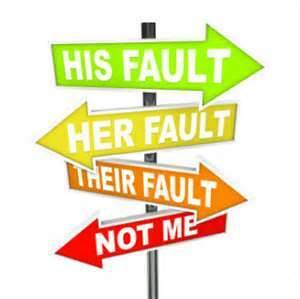 It is a cliché, but if I had a nickel for every time I heard someone blame someone else for something they themselves did, I wouldn’t have to work another day in my life. It honestly blows me away. I see it everywhere. It seems as if no one ever wants to take responsibility for their actions and they definitely do not want to have consequences for their wrong actions for sure. Let someone else take the blame…let someone else take the heat…let someone else suffer for my poor choices. 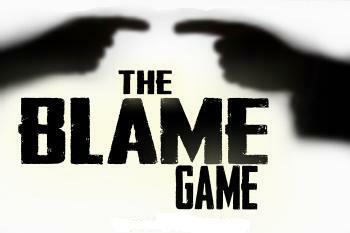 It is evident in our schools, at sporting events, at our city council, even in the churches I’ve attended, the blame and complain game is an epidemic. We blame our parents, our teachers, our bosses and just about anyone else that we could shift the responsiblity on to. Seems like nobody wants to own up to any error or short-coming. It is always someone else’s fault and we’re glad to point the finger at who. There would be less divorce, less road rage, less workplace problems, less complaining, and a lot less unhappy people in this world if we just took responsibility for our own actions. There’s usually enough blame to go around. This problem is as old as Genesis when the first man God created wimped out and blamed the woman for breaking God’s command, and then the woman turned around and blamed the serpent for tricking her. Have you ever wondered how God would have reacted if instead of blaming someone else, Adam and Eve would have just humbled themselves and said, “Yup, I did it. Totally stupid move. Please forgive me, and help me not do that again!” I know as a manager of people I would be ecstatic about that kind of attitude and I’d do everything I could to help the person not make the same mistake again. Let’s do an experiment —–> for the rest of the week make it your goal to blame no one else – even if truly is someone else’s fault! Own up to all aspects of your life this week before God and others and, if your willing, share the results. I’m guessing you’d see a major difference in how you experience God and in the relationships you have with others around you.